"The Next Age: Chapter Two"
Nathan Heywood laments a life that started well, with football promise, and ended in drugs and a missing right leg from the knee down. He's a descendant of Commander Steel, we learn. Flash and Green Lantern leave Wildacat with his son Tom to go investigate Mr. America. Tom reveals that he already knows Wildcat is his father, and has known for years. At the crime scene, the body upsets Starman, who accidentally makes everything in the room float. Power Girl makes him stop, and they all crash into the floor below, contaminating the crime scene. Starman gibbers insanely, and mentions the name Kenz Nuhor, and says a lightning storm is coming. Tom and Wildcat hit off on a rocky start, with Tom saying he doesn't want or need anything to do with Wildcat. Maxine expresses misgivings with Stargirl, who leads her to the wardrobe, reassures her, and offers to make her a costume. 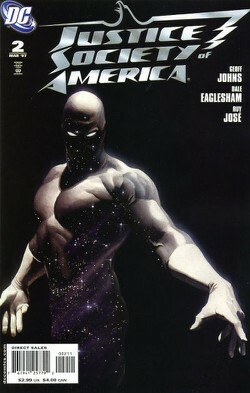 Mid-Nite and Flash begin the autopsy, realize what happened to Mr. America, and find an object lodged in his left lung. Nate Heywood, at his family reunion, is asked to participate. He declines, depressed about his injury. The Fourth Reich drop in, determined to kill every descendant of Commander Steel, women and children first. 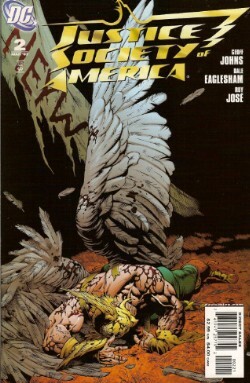 Hawkman is there, attempting to stop them. Back at JSA headquarters, Starman talks of being trapped, and proving that there are multiple universes. He steps back, pulls off his mask, and talks of a place "blown to kingdom come," along with pictures from the Kingdom Come Elseworlds tale. Story - 5: You want your mystery story? You got your mystery story. You want character drama? You got character drama. You want continuity? You got continuity. You want forward motion? You got forward motion? You want Kingdom Come? You got Kingdom Come. From the little things, like Wildcat asking his son if he won his last fight as a way to bond, to the curious hints dropped by Starman, to every distinct character making sense and having a role, I'm loving the new series. Not much to say, because there's very little to complain about. This is fine work. Art - 5: Eaglesham continues to impress me. The panels are dynamic, each character is individual, and when he gets his wings spread in either a dynamic or a double splash, it really knocks you for a loop. Couple that with a few Alex Ross pages, and it's gold. My only oddity, and I don't know who is responsible, is that a one story fall seeming knocks Power Girl out. Huh? I figured the artist would be responsible for that because I can't picture Geoff writing it. Cover Art - 3: Ross usually doesn't let me down, but a black character on a black background makes it feel like the cover is missing something. It's also a trend that's been going on for so long now (character covers) that it makes me want to have Ross stretch himself with these characters beyond a stock character picture.